On January 24, 2013 the Bandung jazz community Klab Jazz launched a spinoff which is highlighting in the spirit of traditional ethnic music either in accordance with jazz or just the traditional music alone. Jazz Nagari, that’s the name of the event, is set to be a regular monthly show featuring bands/ensembles that have the calling to preserve our own traditional music and culture, especially those who are creative enough to create good concept to fit the modern, current music trend in Indonesia. Four episodes have done successfully by Klab Jazz by presenting 4-5 bands in each one. 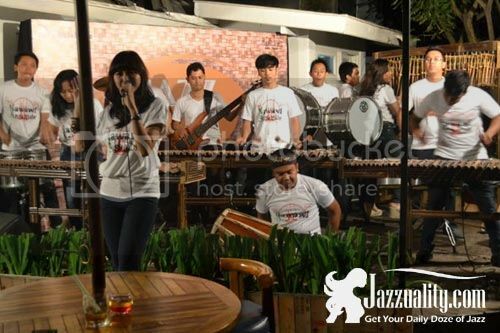 The combination of pure jazz, jazz+ethnic and ethnic gained regular attendance as well as introducing the rich Indonesian cultures to the customers of the venue, Siete Cafe & Resto, making them know that jazz can go hand in hand with the traditional music and showing the openness of jazz in welcoming other genres or musical disciplines. Today we just received an email stating that Jazz Nagari #05 is ready to launch. In this 5th episode there will be 4 bands to participate, two are jazz oriented and the rest is deeply dipped in ethnic sound. Nawawi Ansamble, one of the participants is going to merry this regular event again. We have watched them and know how good they can blend jazz and Sundanese music altogether. The ensemble was ne of the finalists of Trans7’s “Indonesia Mencari Bakat” season 2 and from there the personnels have been working seriously to infuse some jazz into its musical territory. Nawawi is an acronym of Newsletters Marching Band (Pos Indonesia) & Angklung Web Institute, combining musicians from two art institutions respectively. Loaded with young guns with creativity, they manage to bring compositions ranging from the Javanese trad folk song “Cublak-Cublak Suweng” to Chick Corea’s “Spain” or James Brown’s “I Feel Good” without losing their grip in both musical fields. This is your chance to see what they come up as. Sasadana is the other group to bring plates of mystical ethnic music to wow your ears. Representing jazz are Olteje and Tuesday Rhythm. Olteje is the new group of keyboardist Caroline Tjhi who has previously participated in Sunday Jazz @ Plate for Me XXV last month. If you watched and liked them, you should come and see their second attempt at this event. Then a little about Tuesday Rhythm, this band represents the jazz community’s activity with the same name located at Cafe Halaman Studio. This project is focusing on ‘sharing practice’ and delivering the joy of playing jazz. This band comprises of five players, including the keyboardist of Tesla Manaf ft Mahagotra Ganesha and West Java Syndicate, Yopie D Nafis. Jimmy Tedjalaksana (guitar), Henky Suparjan (drums) and Maman Darisman (percussion) are the rest of members. Since the personnels are not a stranger to the fuse between jazz and ethnic, they are perfectly fit to enter the concept of Jazz Nagari. With the spirit of jazz still intact, this event will provide you to the new atmosphere of watching a live show. Served homey but challenging, you can use this as a gate for you to experience the bridge between East and West, Modern and Traditional, not only in the music crafts but also in the instruments used by each band. This event is coming very soon on May 16, 2013. If you’re in Bandung during that date, do come and enjoy it. Superb!! The jazz is composed uniquely with it’s traditional notes and creates a magic around.